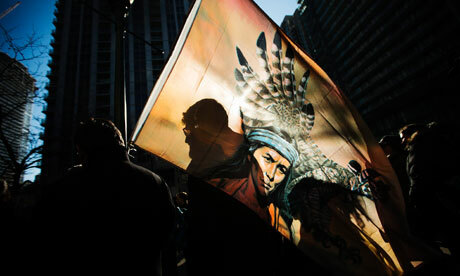 By Martin LukacsIn a boardroom in a soaring high-rise on Wall Street, Indigenous activist Arthur Manuel is sitting across from one of the most powerful financial agents in North America. It's 2004, and Manuel is on a typical mission. Part of a line of distinguished Indigenous leaders from western Canada, Manuel is what you might call an economic hit-man for the right cause. A brilliant thinker trained in law, he has devoted himself to fighting Canada's policies toward Indigenous peoples by assailing the government where it hurts most–in its pocketbook. Which is why he secured a meeting in New York with a top-ranking official at Standard & Poor's, the influential credit agency that issues Canada's top-notch AAA rating. That's what assures investors that the country has its debts covered, that it is a safe and profitable place to do business. This coveted credit rating is Manuel's target. His line of attack is to try to lift the veil on Canada's dirty business secret: that contrary to the myth that Indigenous peoples leech off the state, resources taken from their lands have in fact been subsidizing the Canadian economy. In their haste to get at that wealth, the government has been flouting their own laws, ignoring Supreme Court decisions calling for the respect of Indigenous and treaty rights over large territories. Canada has become very rich, and Indigenous peoples very poor. In other words, Canada owes big. Some have even begun calculating how much. According to economist Fred Lazar, First Nations in northern Ontario alone are owed $32 billion for the last century of unfulfilled treaty promises to share revenue from resources. Manuel's argument is that this unpaid debt–a massive liability of trillions of dollars carried by the Canadian state, which it has deliberately failed to report–should be recognized as a risk to the country's credit rating.Comment: For more on Idle No More, see Nishiyuu Walkers Arrive in Ottawa and Idle No More in Europe.